I never know what to expect when I start going through the paperwork and projects that come home with Juliana each day. Today this picture came home – Juliana is thankful for her brothers. 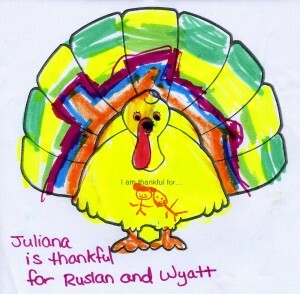 I love the surprise of a thanksgiving turkey on a hot summer day, the stick drawings of her brothers, and the fact that she thought of her brothers above everyone and everything else in her life.